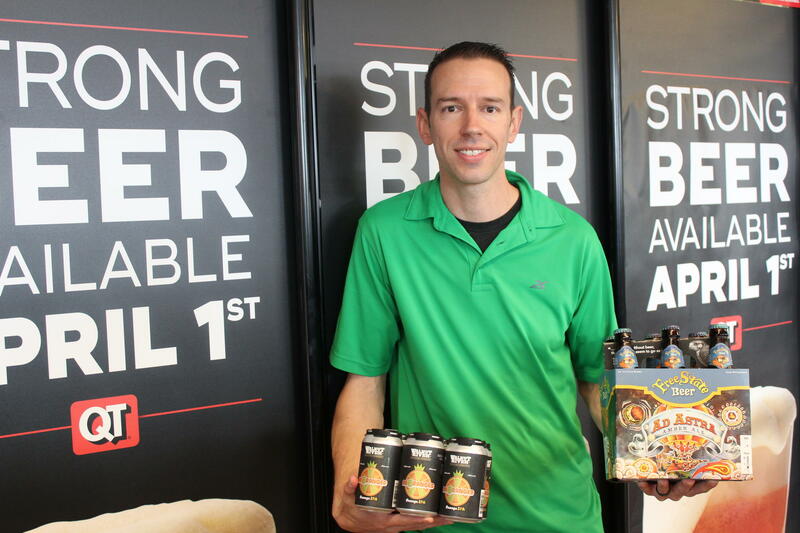 QuikTrip touted the arrival of full-strength beer in the weeks ahead the new law going into effect on April 1. Starting Monday, full strength beer – up to 6 percent alcohol content – will be available in grocery and convenience stores across Kansas. It’s a change two years in the making: Lawmakers passed a compromise bill in 2017, after decades of discussions and efforts to change the state's liquor laws. "In a sense, it feels like Prohibition is finally over here in Kansas," said Ron Wallis, personnel manager for QuikTrip in Wichita. "Those old-fashioned laws and limits that were placed on beer many, many years ago have finally been updated." Kansas was one of the last states with 3.2 beer limits. QuikTrip has sold cereal malt beverage for about 60 years, Wallis said, but the stores have been working to sell out of the remaining product as they make room for stronger beer to hit the coolers. Ron Wallis, personnel manager for QuikTrip in Wichita, says the looser law allows convenience and grocery store to carry more local beers. He says the potential for new revenue is "huge." "This is something that our customers are very excited about," Wallis said. "We’re going to be able to sell products we’ve never been able to carry before. "We’re going to be able to focus on more local and regional breweries. We’re going to be able to carry craft beers that we haven’t been able to in the past." Wallis says the new law "levels the playing field." "It's going to be different for a lot of businesses in Kansas." As part of the compromise reached with the advocacy group Uncork Kansas -- which lobbied for the change -- liquor stores will now be allowed to sell more non-alcoholic products, such as mixers, shot glasses and snacks. But Brian Davis, director of the Kansas Association of Beverage Retailers, said it’s unlikely those sales will make up for lost beer revenue. "The bad part about this compromise is that ... liquor stores are going to close," he said. "Kansas-owned businesses will close." Davis' family owns three liquor stores in Wichita. He says they'll update their stores gradually, rearranging the floor to bring in new products. "We’re not trying to get anything done on (April 1)," he said. "We’ve got computer things that need to get done. There’s a lot of behind-the-scenes that we’ve been working on." Davis said as a retailer himself, he can see the benefit of bringing in new products and giving his stores a different look. The stores that succeed under the new law will be the ones that can adapt, he says. "We as retailers are just going to have to learn to make changes," he said. "As the years come, we’ll be able to grow what we’re keeping. We’ll have a better familiarity with how to market having different items." The law is limited to beer, and it excludes any product with an alcohol content higher than 6 percent. The issue isn't in front of the Kansas Legislature this session, but Wallis with QuikTrip says in the future, he'd like to see stores like his sell other types of alcohol, too. "We are hopeful that one day those limits will be eliminated on alcohol content for beer," he said, "and one day possibly that we can carry products like wine." Davis says his group had a "handshake and a verbal agreement" with Uncork Kansas as the two sides worked to reach the compromise in 2017, but that won't stop other national chains from possibly reviving the fight to further loosen Kansas' liquor laws. But he says he and others in the industry are ready to once again push back against those efforts. "I'm expecting in the next few years that we'll have to fight again," he said. For many decades now, the only beer you could buy in Kansas grocery and convenience stores was limited to 3.2% alcohol. But on Monday, that 3.2 beer will be a thing of the past. Kansas grocery and convenience stores will be able to sell regular beer starting in 2019 after a years-long effort to get full-strength brews into the stores. Republican Gov. Sam Brownback signed a bill Tuesday allowing grocery and convenience stores to sell beer with up to 6 percent alcohol by volume. They can now sell cereal malt beverage with 3.2 percent alcohol by weight. In exchange, liquor stores will be able to sell cereal malt beverages and more non-alcoholic products, such as shot glasses, mixers, lottery tickets and tobacco products.